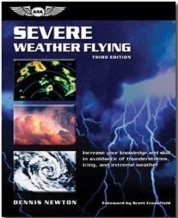 This book discusses each aspect of weather as it relates to aircraft operation and flight safety. A valuable resource for more than 30 years, in this Fourth Edition the author introduces the latest modern weather prediction models and technology, with instruction on how every pilot can use them to their advantage. Now includes Change 1, effective January 2018. This document is organized using the FAA’s three distinct types of aviation weather information: observations, analyses, and forecasts. 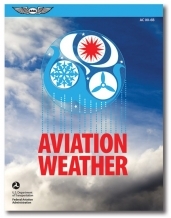 Within this construct and with the support of full-color illustrations throughout, AC 00-45H1 explains U.S. aviation weather products and services. Available in book only or e-bundle (book + software download code). 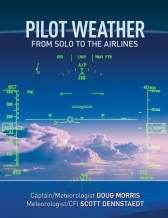 First edition of Pilot Weather: From Solo to the Airlines. 394 pages, over 400 diagrams & pictures, plus a 550-entry glossary. Consists of 33 chapters on the A to Z of aviation weather. Includes the theory of meteorology & numerous chapters explaining the details of how to critically decipher many important aviation weather reports and forecasts. Pilot Weather caters to all pilots... from your first solo to flying for the airlines.